A cold frame is a simple lidded box that provides protection from cold wind and creates a warm, greenhouse-like environment when the sun’s rays enter through a transparent covering. A cold frame can extend the growing period as long as three months. 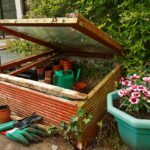 Although you can easily purchase a cold frame, many gardeners prefer to construct DIY cold frames from repurposed windows. 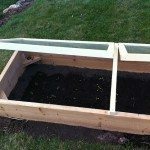 Making cold frames from windows is relatively easy with a few basic woodworking tools, and window cold frames can easily be constructed to serve your particular needs. Read on to learn the basics of how to make cold frames out of windows. First, measure your windows for cold frames. Cut boards for the sides, allowing the window to overlap the frame by ½ inch (1.25 cm.). Each board should be 18 inches (46 cm.) wide. Join the wooden pieces, using steel angles and ¼-inch (.6 cm.) hex bolts, with washers between the wood and the bolts. Use wood screws to attach metal hinges to the underside of the window frame. The cold frame lid will be hinged along the length, and should be sloped to allow entry of maximum sunlight. Use a straightedge to draw a line diagonally from the bottom corner of one end to the top corner of the other end, then cut the angle with a jigsaw. Use hex bolts to attach the hinges to the wooden frame. 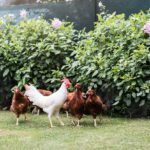 Attach chicken wire across the cold frame to support seed flats and keep them above the ground. Alternatively, construct wooden shelves for heavier flats. You can also create super-simple DIY cold frames by laying windows on a frame constructed of concrete blocks. Be sure the blocks are level and straight, then provide a thick layer of straw to serve as a dry, warm floor. This easy window cold frame isn’t fancy, but it will keep your seedlings warm and toasty until temperatures rise in spring.